In 2016 Rob Pope embarked on an enormous journey, running across the United States (and beyond) to raise both funds and awareness for causes he really believes in - Peace Direct and the World Wildlife Fund. His journey took him across the nation entirely more than FOUR TIMES, covering over 15,700 miles and resulting in several records (including a Guinness World Record) and many, many more significant milestones. To learn more about Rob’s journey across the USA, scroll down to the ‘About Rob’ section. The Marathon des Sables is an annual six-day ultramarathon held in Morocco covering 156 miles (250 km) - the length of six regular marathons. Situated in the largest and most inhospitable hot desert on Earth - the Sahara Desert - and requiring participants to carry all of their food, this is one of the world’s most intense and gruelling adventures. Rob will be competing in this, the 34th edition of the marathon, from April 7th 2019. He will once again be raising funds and awareness for Peace Direct and the World Wildlife Fund, so please support him here and through social media channels as well as supporting the causes he cares so deeply about with a donation. UPDATE! Rob has finished in 14th place overall, in a field of world champions and is tired but happy. See the blog for his race report! The course is made up of six stages. To see the course and Rob’s progress click here and search for Rob by name or by his tracking number, which is 217. Rob Pope is an emergency veterinarian by night and runner by day. No beginner marathon runner, Rob became the Australian Marathon Champion at the Australian Marathon Championships in 2015, won the Liverpool Rock 'n' Roll Marathon in 2015 and 2016, where he ran a personal best of 2:27:13. 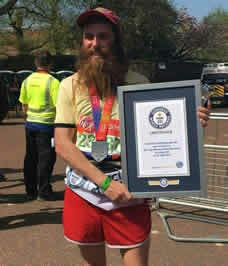 He also now holds a Guinness World Records for the fastest marathon completed while dressed as a film character. Rob first ran him from Mobile, Alabama all the way to Santa Monica Pier in Los Angeles, California. He then turned around and ran even further back across some 18 states to the Marshall Point Lighthouse in Maine. When he got there, he turned around and kept on running! He then became the first person ever to run across the United States of America THREE TIMES in a year since completing his third crossing in September 2017. Rob ran over 15,700 miles, finishing the FIFTH leg of his run in Monument Valley, where he became the first person EVER to complete the run that Forrest Gump did in the film. It's a huge distance - the greatest distance anyone from the UK has ever run in a year - and Rob, the WWF and Peace Direct need your support, so please check out the charities and make a donation. The World Wildlife Fund is the world's leading conservation organisation, working in 100 countries and with close to 5 million members globally. Peace Direct believe that local people have the power to find their own solutions to conflict – and to build their own better futures. In the world’s most fragile countries, Peace Direct seek out local peace-builders who are making a real difference – building peace from the grassroots up, preventing conflict in the places where it starts – locally - by disarming rebels, resettling refugees, healing communities, reviving economies. They work at great personal risk on crucial problems like child soldiers, women and conflict, youth and peace, political violence. They are the key to preventing conflicts and creating a lasting peace. Peace Direct find them, fund them, and promote their work to those in the wider world who can help with finance or influence. Not your typical motivational speaker perhaps, but who actually believes those guys anyway? Rob(la) is able to hold any audience large or small, young or old in the palm of his often sweaty hand and amaze, amuse and a-motivate in a real way that doesn't have you reaching for the sick bag, which will should hopefully result in...results. Whether you're a company, conference, community organisation, sports club or educational establishment, Rob guarantees to make your day 86.4% better, so if you would like a talk, a visit, group run or Q&A, email goingthedistancerun@gmail.com for an informal chat and we'll work on the remaining 13.6%. Sure running's great for getting from A to B (or AL to CA) but in this case it's serving a much more important purpose, and that's where you come in. The aim of Rob's run is to raise awareness and funds for these two amazing causes - the World Wildlife Fund and Peace Direct - and every little bit helps. Everything helps and is greatly appreciated. Thanks! Get in touch here or via social media to show your support. If you’re interested in supporting Rob’s continued journeys in another way such as sponsorship, you can get in touch below.